Sloths are adorably cute and intriguing, which is likely why you visit this website and read these awesome articles in the first place! Have you been searching for something to proudly display your love of sloths as you go about your day? If so, then keep reading! This list of Nine Stunning Pieces of Sloth Jewelry You Will Adore is just that, a list of awesome sloth jewelry that will simply captivate you! Whether you buy them for yourself or a fellow sloth lover, these pieces of jewelry are simply adorable and will have people complimenting you every time you wear them. This silver sloth necklace is hung on a 12 inch chain with a lobster claw clasp. The little guy hangs here just as sloths would hang in trees in the jungle. Just wearing it will transport you into the South American jungle where these little guys and gals call home. While they come in both silver and gold, the one featured here is silver. It will make a fantastic addition to any jewelry box, and you or whomever you choose to buy it for will cherish it for years to come! At a reasonable price, this beautiful necklace can be yours for less than the price of a dinner out. Earrings are a great fashion statement and button earrings have become all the rage these days. Teens and even adults are moving away from conventional diamond earrings and instead moving towards more unique pieces of jewelry. 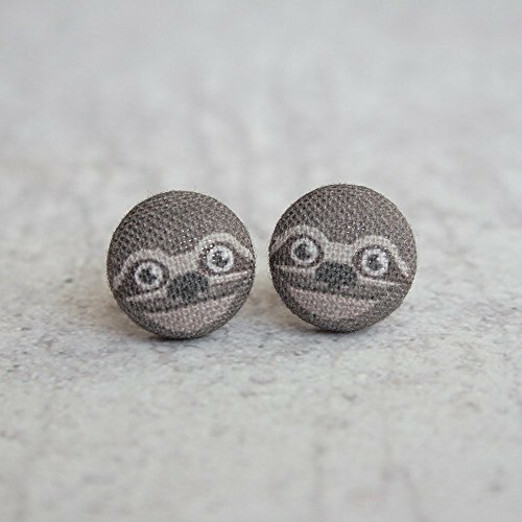 That’s what makes these sloth button earrings such a great find. These fabric button earrings feature little smiling sloth faces and are honestly the most adorable earrings we’ve seen around. They will be sure to make a fashion statement and for such a low price, they won’t break the bank either. They are made out of 100% cotton and the posts are nickel-free, so they’re safe to wear as well! “Perseverance -Keep moving forward. Never give up. Great things take time. 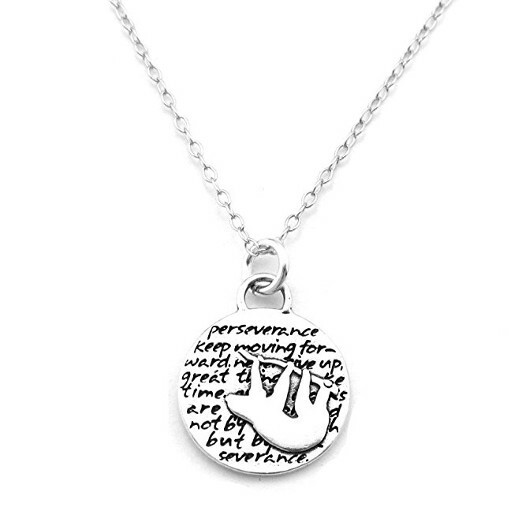 Great works are performed not by strength, but by perseverance.” These wise words and the words that a sloth might live by, can be yours on this reversible, sterling silver sloth pendant. It’s a small price to pay to add this adorable pendant necklace to your collection. The necklace comes on a 16-inch chain with a lobster claw clasp to secure it in back. It’s made in the USA – where sloths aren’t – and even comes with complementary gift packaging. Take these wise words with you wherever you go. You won’t regret this purchase, we promise! Sloths are tree dwelling animals that are commonly found in the jungles of Central and South America. As arboreal animals, they spend the majority of their days in trees. In fact, the only time they come down is when they have to urinate or poop! 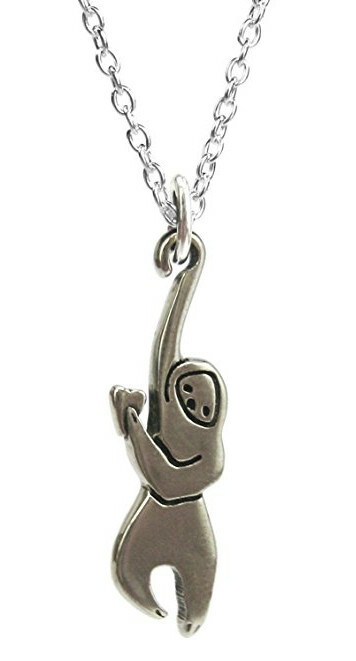 That’s what makes this sterling silver sloth necklace so adorable, the fact that it replicates exactly how a sloth spends its day hanging in the trees. 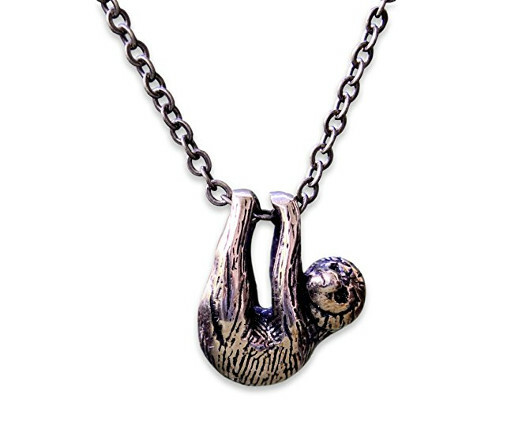 For a fair price, you can get this sloth necklace with a 16 inch, 18 inch or 20 inch long chain. They are cast in sterling silver using a lost wax process and are made right in the United States! Do you need some inspiration in your life? While sloths aren’t generally on par with the Lion and Tiger inspirational quotes about attacking life and being courageous, they still carry an important message. These little creatures always look like they are smiling, which is why Shagwear included them in their line of inspirational animal necklaces. 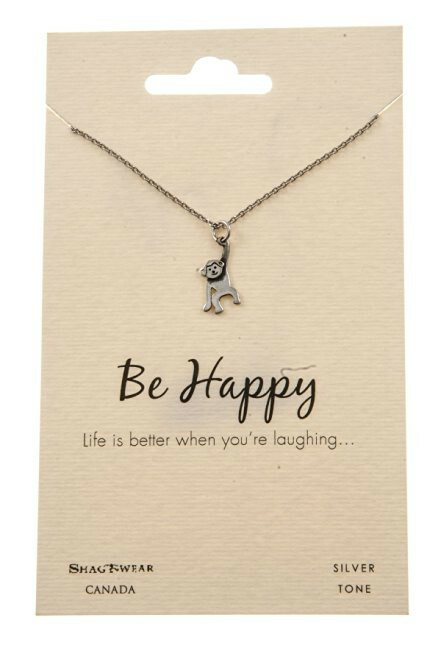 With the tagline “Be Happy – life is better when you’re laughing,” this adorable pendant made by the Canadian jewelry maker is a fantastic piece of jewelry. For such a low price and with FREE shipping, why wouldn’t you buy it? Side note – this is actually a monkey, but we won’t tell if you don’t! 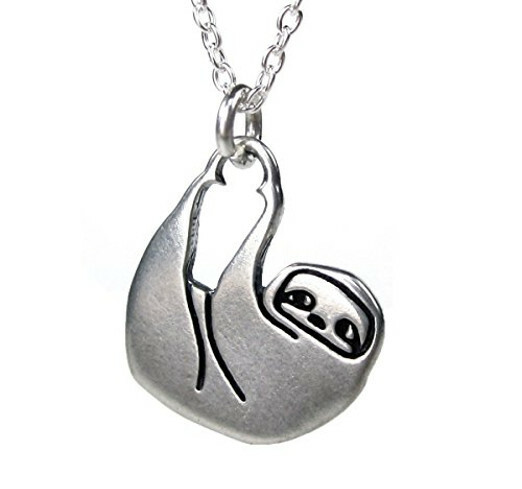 This hanging sloth pendant necklace really is adorable. Imagine the jungle creatures hanging in the trees all day and it will surely bring a smile to your face. You can take that sentiment with you and bring this Mark Poulin White Bronze Necklace wherever you go! Hanging on an 18” chain, this necklace will not cost you a fortune, despite how good it looks. It’s made in the USA and the chain is silver plated brass. 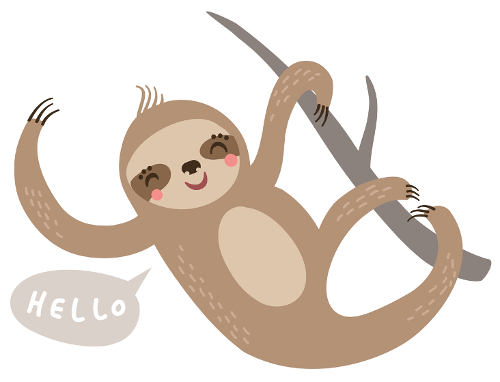 Take the relaxed image of a sloth hanging out in the trees with you and wear it proudly! Are you trying to catch up on the accessorizing trend? It seems like wherever you go girls have their wrists filled with bangles or watches while three different necklaces hang from their neck. The trend can be a bit hard to follow, but we can promise you one thing. 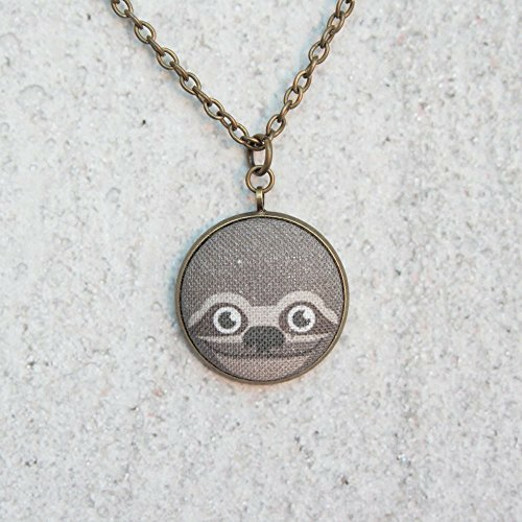 This Sloth Fabric Button Pendant Necklace will put any other non-sloth accessory to shame! The girls with chokers and 15 bangles on their wrist will be asking where you got your adorable fabric sloth pendant, and you can smile proudly while you tell them that this beauty only cost you a fraction of what you’d expect on Amazon. Clearly, the most expensive piece of jewelry on our list, this hanging sloth pendant necklace pales in comparison to the cost of an expensive diamond or real gold necklace. In addition, honestly, it’s 100 times more amazing than the generic aforementioned necklace types. For the hefty price tag, this silver plated white bronze necklace, which is hung on a 24-inch chain, will have your family members and friends simply dazzled. They’ll be wondering where they can get one of their own! All aboard the adorable sloth earring train! Repeat…all aboard the adorable sloth earring train! 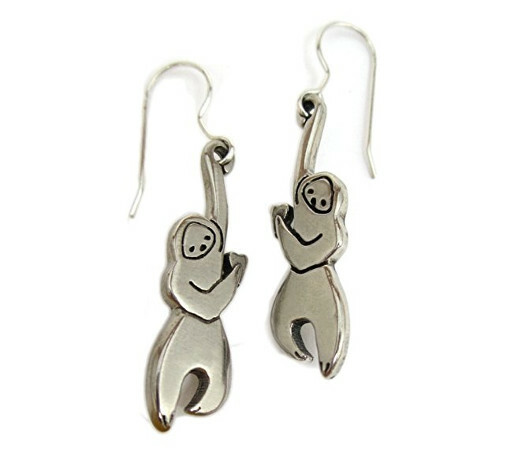 This gorgeous pair of white bronze earrings features a hanging sloth on each ear, and is simply to die for. For a reasonable price, this cute Made in America pair of earrings can be yours! They are 2 inches from the top of the wire and hang from stainless steel ear wires. You might miss the intricate detail, but both of the sloths are holding hearts. These are a great gift to the special woman in your life. We promise that she’ll absolutely love them! Find all of our amazing sloth gear on our dedicated sloth product page, click here! Which delightful piece of sloth jewelry did you go for?